If you can’t get enough of CBS shows, you’ll like CBS All Access. Everyone else might want to look elsewhere. Read our CBS All Acces review and decide for yourself if the streaming service holds a candle to its competitors. You’ll also find a huge list of CBS programming available for live or on-demand streaming, including episodes of popular shows like NCIS, Blue Bloods, and The Good Wife. But finding episodes for seasons past can be hit or miss, and for us, the list of available movies left a lot to be desired. Here’s our take on how CBS All Access stacks up for both CBS fans and those just looking for an all-around live TV streaming service. Which shows are on CBS All Access? CBS All Access lets you stream CBS original programming, popular shows, and yes, even NFL games. There’s an awful lot of Pink Panther on this list of CBS All Access movies, but the lineup does change often. Chances are you’ll find your favorite CBS show on CBS All Access, but you may not be able to watch all the episodes. We noticed some shows included only the most recent season—which is a huge bummer in case we want to refresh our memory on The Big Bang Theory season three, episode eight, which explains just how important adhesive ducks are when it comes to bathroom safety. Can I stream live TV with CBS All Access? Streaming live TV is possible, but it’s not available in all markets. Currently, CBS All Access Live TV is available only in certain markets, but it’s pretty easy to check if yours is included. Just head to the CBS Live Access site and scroll down to “Check availability” under “Stream Live TV 24/7.” Then let the site automatically detect your location to find out if live TV is available to you. We like that CBS All Access is available on several common devices. You’ve got two choices: limited commercials or no commercials at all. CBS has two plans to choose from for its streaming service, and the only difference—besides the price—is that one has commercials and one doesn’t. That’s it. You’ll get the same shows and movies with either plan. The basic CBS All Access plan is the Limited Commercials plan. However, while watching the first episode of Star Trek: Discovery, commercials certainly didn’t seem “limited”—there were five commercial breaks. The other CBS All Access plan, Commercial Free, costs $9.99 a month, but you won’t find any difference in content—you’re just paying more for no commercials. We don’t mind paying extra for commercial-free programming—we subscribe to premium Hulu for the same reason. But when you consider how much more programming Hulu has for a similar price, you might question the $9.99 a month for the CBS All Access Commercial Free plan. If you’re interested in the Commercial Free plan so you can skip ads, you should know that if you watch the shows live, there’s no way of escaping commercials on live TV. It’s just the nature of the live TV beast—and it’s the same with every other live TV streaming competitor. CBS All Access comes with pretty standard features like two streams and playback options for on-demand content. The biggest issue is the limit to 720p resolution. If you plan to watch on a TV larger than 50″, you may notice the image isn’t quite as sharp as 1080p programming. If you’re streaming on a device smaller than that, you’ll be just fine. Really, it’s only the limited selection of channels and shows that keeps CBS All Access from being some down-and-dirty competition for the likes of Hulu and others. With only three live TV channels, CBS has a lot of ground to make up. It really comes down to this: How bad do you want CBS shows? Should you go for CBS All Access, or is another streaming service better? Great question. Honestly, it depends on what other streaming service you’re comparing it to and what you want out of it. *CBS All Access channels include a local CBS channel if one is available in your area, CBSN 24/7 news, and CBS Sports HQ. 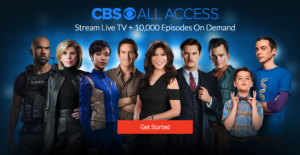 Compared to its competitors (streaming services that also feature live TV), CBS All Access is by far the cheapest option. And if most of the shows you can’t wait to live stream belong to CBS, it’s good to know CBS All Access is probably the only place you’ll find them. But with that lower price comes a limited selection of TV shows, movies, and live TV. Even Sling TV includes at least 25 channels, while the rest of the competition offers far more. Think Sling TV, Hulu with Live TV, or other TV streaming services might be a better fit for you? Check out our in-depth reviews of each one to find out. And when it comes to add-ons, CBS All Access doesn’t offer HBO, SHOWTIME, or a large variety of sports channels. Dare we miss out on the next episode of Game of Thrones? How is that even a question? You know nothing, Jon Snow. CBS All Access is your ticket to all things CBS, but if you’re not interested in CBS shows, check out other streaming services. The name of this CBS streaming service feels a bit misleading. We expected to have “all access” to a slew of exclusive CBS shows, but instead, we got full access only to some and limited access to others. To be fair, if you live for CBS dramas, like the snarky back-and-forth commentary between McGarrett and Danno on Hawaii Five-0, or if you need a daily dose of NCIS (how does Gibbs fit that boat in his basement, anyway? ), CBS All Access is a dream come true at a great price. But if you’re looking for more features and more channels, a different live TV streaming service might do you good.